The Ulster kid calculated before making the trip that he would go to fifth in the world with victory this week. But he may not be aware that he would also become the youngest winner in the history of American professional golf. Who needs Tiger when you have a player of such natural talent to enjoy? Set to face 2006 champion Geoff Ogilvy in Saturday morning's quarter-finals, McIlroy was tipped as the heir apparent to world number one by his stable mate and possible semi-final rival, Ernie Els. "He's hungry, as we say," Els said. "So he's going to be a major factor in world golf. I think that you are probably looking at the next number one in the world with him. "He's got all the tools. And he's probably got the current number one hopefully not doing what he has been doing the last three years. So he's got a lot going for him." Clark provoked a mass exodus from the press centre by the American media when he ended Woods’ comeback story with an emphatic 4 and 2 win victory in Thursday’s second round. 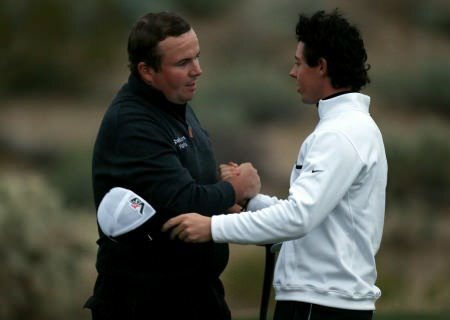 But he was overpowered by a brilliant McIlroy who was delighted to make it to the last eight and while he was flattered by Els' comments, he truly believes he has the game to go all the way this week. "Coming from an ex number one, it's great," McIlroy said. "But I still have a long way to go. And my main goal is to try and get into the top 10 in the world and then if I can do that, I'll try and get to number two. Hopefully Tiger will come back fit and strong." As for his win over Clark, he added: "I don't think Tim played his best golf today. Understandably he was probably a little flat after all that happened yesterday. And I came out and got off to quite a fast start and got an early lead and I was able to hang on and get the win. "I had a big advantage off the tee - 60 yards and the rest sometimes. At the 13th he was going in with three wood and I hit an eight iron. I hit it high and I was able to stop it quickly." As for Ogilvy, the 2006 US Open champion who beat Colombia's Camilo Villegas 2 and 1, McIlroy said: "Geoff Ogilvy is a class player but I think I can win this tournament. You’ve got to believe you can win. I don’t know if that’s cocky but that’s the mindset you’ve got to go out with. You’ve got to say I am going to beat this guy." South African Clark had no answer against a fearless teenage opponent who blasted the ball up to 60 yards past him off the tee. The stocky world number 33 didn’t make a bogey in the first two rounds as he despatched Retief Goosen and Woods with some faultless golf. But he was struggling straight away against a sensational McIlroy, who won the first with a par four when the South African was forced to chip back to the fairway after pushing his drive into the desert scrub. The teenager’s power was a major weapon on the 7,800 yard Jack Nicklaus course and he easily topped the driving distance statistics with an average drive of 319 yards giving him a huge advantage over pint-sized Clark. The Holywood kid reduced the 574-yard, par-five second to a 369-yard drive and a nine iron to go two up with a simple, two-putt birdie. And after halves in par at the third and fourth, he out-drove the South African by 60 yards at the fifth and then hit his approach to seven feet to extended his advantage to three holes. Moments later he was four up, courtesy of a glorious iron shot to 14 feet at the 185 yard sixth and while Clark hit back to win the seventh with a tap-in birdie from two and a half feet, he was soon four down again. At the par-five eighth, Clark bunkered his approach short of the green and couldn’t match McIlroy’s chip and putt birdie from the apron. The next four holes were halved in par figures and while McIlroy hit a 371-yard drive at the par-five 13th, Clark matched his birdie by finding the green with a 258-yard fairway bunker shot to 17 feet. Clark looked certain to win the 14th when he hit his approach to just five feet but his broomstick putter let him down and he went four down with just four to play. It all ended at the driveable 15th, where McIlroy missed a 15 footer for the match and looked on as Clark failed to hole from just inside him to survive for another hole. McIlroy will face world number eight and 2006 champion Geoff Ogilvy of Australia with the winner of that one taking on Ernie Els or Stewart Cink in the afternoon semi-finals. Els beat Luke Donald by two holes after the English star tweaked his wrist on the 17 tee and conceded the match on the 18th tee while Cink accounted for a wayward Mickelson by one hole. After missing six months of last season following wrist surgery, Donald was one down playing the 18th but conceded after straining his wrist hitting his drive at the 17th he decided not to risk further injury. “Maybe I am being ultra-cautious. But I will have it checked out and hopefully it is just a minor strain,” Donald said. The defeat of Woods on Thursday prompted the American press to vote with their feet with CNN recalling its crew to Atlanta and correspondents for papers such as the influential Los Angeles Times heading back to the west coast. Given the quality of McIlroy’s performance yesterday, Woods can be grateful that he was at home looking after his 18-day old baby boy instead of going “mano a mano” with the 19-year-old Ulsterman. His chief rival for the world No 1 spot, Mickelson, was always in trouble against Cink after falling three down after four holes. The left hander levelled matters by the 13th but lost the 15th after driving into scrub on the left, drew level with winning par at the 16th, lost the 17th to a bogey five and then failed to rescue the situation at the last. On the other side of the draw, England’s Ross Fisher had seven birdies as he crushed Jim Furyk 4 and 3 while Paul Casey was four up against Sweden’s Peter Hanson with four to play. The plaudits keep on piling up for Rory McIlroy following his phenomenal PGA Tour debut in the WGC-Accenture Match Play Championship in Tucson. But it appears that the only person who was unsurprised by his run to the quarter-finals was the young gun himself.